So how’s that geographic-themed garden going, hm? I haven’t written much this year about my Vegetables Around the World theme for the Derwood Demo Garden vegetable beds. The concept is that one side of the path represents the Americas, with plants originating in those continents, and the other side has plants from Europe, Africa, and Asia. The object is to teach visitors (and gardeners) something about food origins, and make them think about history and trade and agriculture and how the concept of “native plants” plays out in the food gardening world, and perhaps tweak their ingrained notions of what “regular vegetable gardens” are. So, how’s it going? Well, I can’t speak for what’s happening in visitors’ heads. Most of them I talk to want to chat about stink bugs (which brings up other issues surrounding international trade and its accidental disasters). I’ve had some good discussions with fellow MGs, and I hope some people are reading my signs and learning something. Aside from that… well, it’s been a tough summer in the garden. A lot of our standard, backbone plants, like tomatoes and peppers and beans, are not growing well, and that’s not counting the ones I always have some trouble with, like squash and melons and cucumbers, none of which have done well at all. Setting up the garden in this way means I can be much less flexible about substituting one plant for another that’s died. For example, I can usually just ignore melons if I don’t have confidence in growing them, but this summer I really wanted to include them because they were part of the “Africa” list. I have one, itty-bitty Minnesota Midget cantaloupe forming, and all the other plants but one have croaked. If the melons die, I can’t put squash in their place, because squash is native to the Americas and belongs on the other side of the garden. I’ve had to be a little flexible with the rules, since we already had asparagus and rhubarb growing on the Americas side where they don’t belong. Also, a patch of New Zealand spinach kept coming up in the middle of “Africa,” and I finally got tired of trying to move it to an island somewhere and just let it be (it’s doing great). We also had a mouse melon (from Mexico) growing close by – it came up by itself on the opposite side of the path from where it grew last year, apparently from a seed that stuck to an arbor stake and was carried over there when we moved it. I think it’s been overwhelmed by the cucuzzi gourds, though. And – don’t tell anyone – after the winter squash died in the ever-increasing shade of the Jerusalem artichokes (a North American native, nothing to do with Jerusalem), I decided to plant a fall crop of turnips and kale there (native to Europe). Speaking of Europe, a lot of the plants native there grow best here in the spring and fall, so that area has looked a trifle bare (or buggy and bolting, if I didn’t rip the plants out) all summer. I hope to have some decent fall crops coming along soon. And most of the rest of the world got a late start because those plants needed warm temperatures. It’s been an interesting experiment. So I thought I’d give you some cautions in case, for some absurd reason, any of you ever want to try it. Plan carefully, is all I can say, and have alternatives in mind. They are taking over that entire section of the garden and producing some startling edible (up to a couple of feet, at least) fruits. The luffa vines are vigorous, although not as prolific as last year’s, and the bitter gourds are beautiful, with their long vines and sculptural fruit. 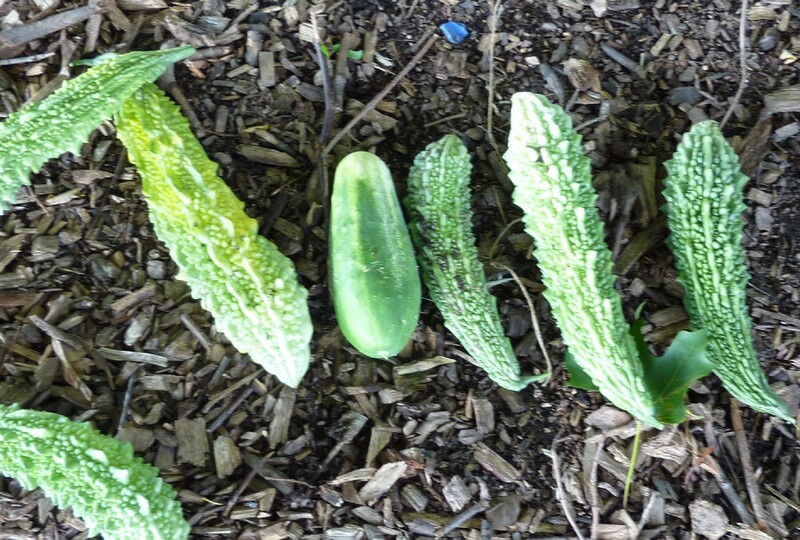 (That’s six bitter gourds and a cucumber, unfortunately our last cucumber.) I have tried cooking and eating bitter gourd, according to the best advice (thank you Rani and Wendy), and well, in small quantities I find it kind of good, but not in large quantities, which is what we have. I’m sure we’ll locate some eager takers, though, and I’m inclined to grow it again next year just because the plants are so gorgeous (and successful). You may notice a gourd-related theme here, and also that these plants are all tropical in origin. 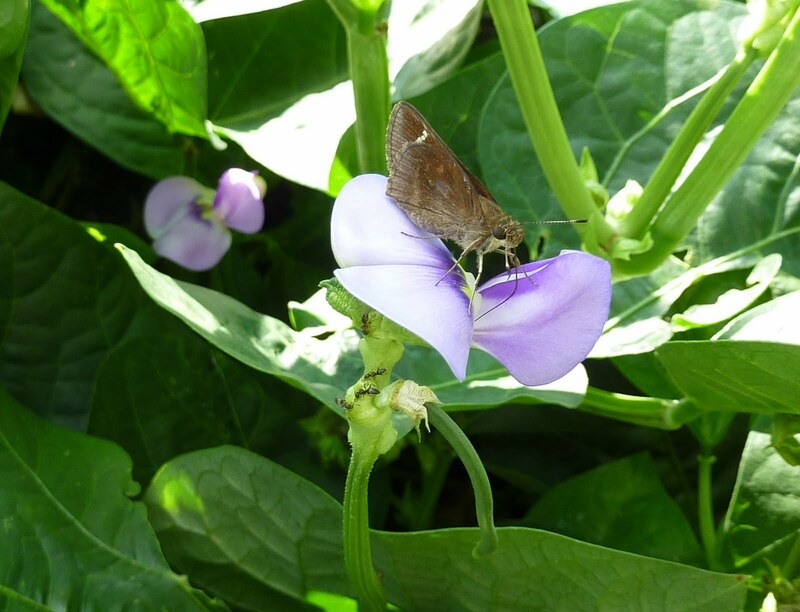 We’re also doing fine with potatoes and sweet potatoes, mouse melons (though they’re not as fruitful as last year’s), and the Vigna unguiculata duo of Asian long beans and African cowpeas – the latter aren’t producing yet, but they had a late start due to rabbit issues, and the lovely flowers have now made an appearance. And they are not covered with aphids, which is what usually happens. Herbs and flowers are in general doing very well, and I’m sure there are other successes that I’m not remembering in my relentless alas and alack, rue the summer attitude. Celeriac, beets and Swiss chard, yes! And onions. No more geography, though. 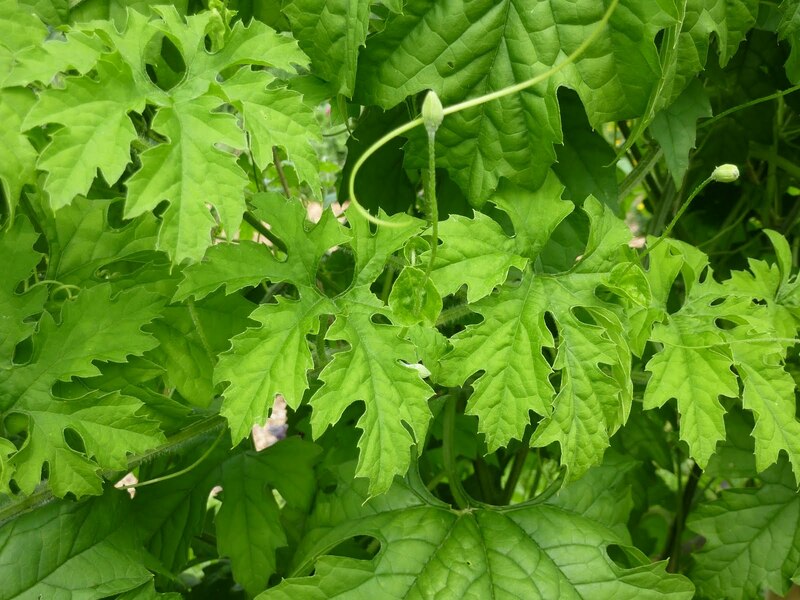 Next year’s plan, as I’m formulating it, is to plant with two ideas in mind: one, to highlight plants that have grown consistently well for us, that gardeners might want to try; and two, to pick several “conventional” garden plants that have presented difficulties, and try several methods for dealing with those problems. 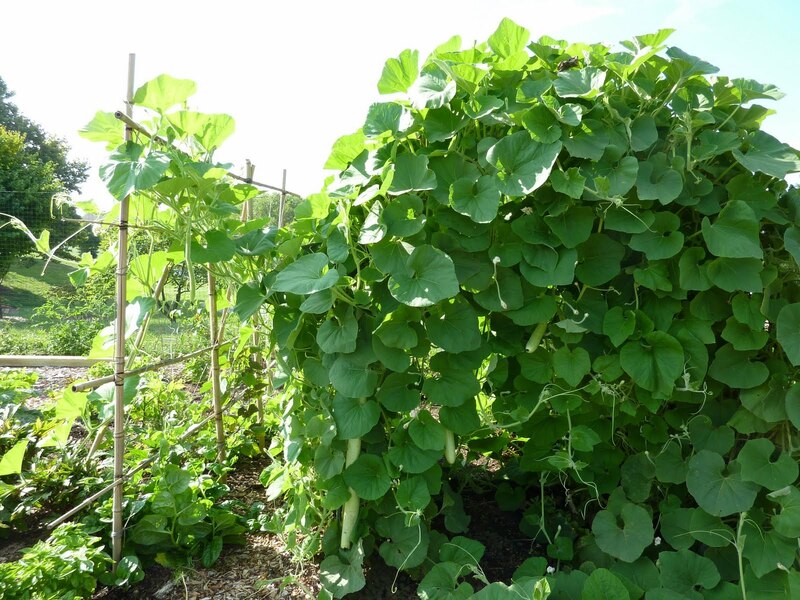 In this category will be, at least: tomatoes, squash, cucumbers, melons (oh, please, let me grow melons), and beans – what is up with beans, I ask you? I am having no luck at all. And – though I am really tired of drowning harlequin bugs – the brassicas, such as kale, cabbage, broccoli, Asian greens, etc. So, that’s next year, but for this year you still have time to visit us at the Agricultural History Farm Park and explore the vegetable world. We’d love to see you!